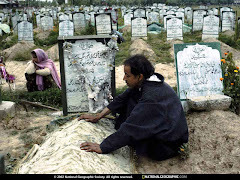 HUMAN RIGHTS VIOLATIONS IN KASHMIR: CAN WE SURVIVE AFTER INDEPENDENCE FROM INDIA? Of course WE CAN. 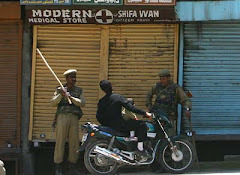 India has been pursuing its policy of what the economists term as a "DEPENDENCE SYNDROME" in Kashmir. No doubt they finance our budget and provide us funds every year, yet how much they take from us mostly goes unnoticed. Out of NHPC's total capacity of generating 2400 MWs of electricity, 1600 MWs are generated (read stolen) from Kashmir. Government of India signed "Indus Water Treaty" way back in mid seventees with Pakistan thus inflicting losses to the tune of trillions of dollars to our state without ever compensating for the same. Owing to our rich water resources, our state has a total potential of producing 22000 MWs of power annually which shall be sufficient enough to electrify entire India, I guess. Five rivers on which Pakistan has been given rights under the afore-mentioned treaty to generate power could have changed the entire demography of development of our valley over years. Besides we have a huge potential for producing raw material worth trillions of dollars for the herbal drug industry. This region is endemic to a large number of medicinal and aromatic plants. This sector is absolutely virgin and unexplored and can fetch us huge money in the international market if exploited properly. Nature has bestowed our fertile land with this invaluable gift. Our land grows world's best saffron and all of us know the cost of every ounce of it. Our valley is one of the richest source of several minerals like bauxite. This untapped industry can sustain for decades to come. 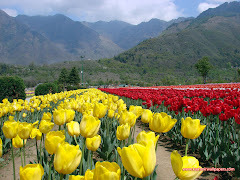 We know world's best neelam is extracted from Padder area in Kishtwar. Our tourism industry is our biggest asset besides our handicrafts. 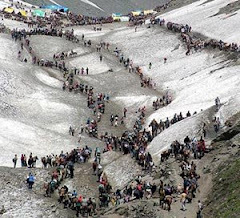 Once we are free and peace prevails in the region, tourists in lakhs from across the world will throng our serene destinations and our priceless carpets besides other handicrafts can fetch us currency of all nations in the world. Our fruit industry that has been made to suffer during the economic blockade imposed by right wing hindu fundamentalist forces is a big industry with a potential to earn good surplus. Only thing needed is opening up of natural trade routes of Kashmir through Muzaffarabad, Rawalakote, Skardu etc. India has been funding us in a very tactful manner over the years. They invest in areas like hydroelectricity which will ultimately benefit none else than India itself. Their game plan is to keep Kashmiris always dependent upon central funds. They don't let us stand upon our own feet, they don't let us generate our own income and income for our brotheren. 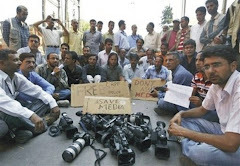 They provide us crores in the form of wages but nothing much for our industrialization and economic self-reliance. That is the reason why m0st of our youth are unemployed and craving for government employment because there are hardly any opportunities in private sector. There are many other areas that make our claim for freedom more economically viable that I shall discuss in my next post. Srinagar, Sep 5: We had set out this series to question the crazy, rogue, devious discrimination rhetoric of the ‘nationalists’. A rhetoric which has yet again proven indispensable to the ‘secular’ trishul-wielding citizens in their latest jameen triumph over their ‘communal’ subjects. 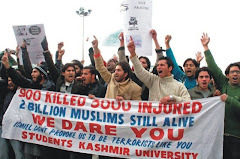 The blood of six ‘martyrs’ in Jammu valued more than the blood of fifty odd ‘infidels’ in Kashmir. Their two month losses in trade somehow added up to more than the two decade losses we suffered. The ‘agitation’ in Jammu became a matter of national emergency and moral priority while the Kashmir ‘dissidence’ became separatist propaganda. Their committee ‘accords’ our land to them, representation no bar, sentiment no bar, environment no bar, majority no bar, a no bar, well even law no bar. Never mind. We called their bluff. Their outshining engineered numbers versus our fading shoddy representation, their ‘coerced’ development versus our ‘destined’ catastrophe, is for everyone to see. And for us to highlight. Please. We hope the previous articles have dispelled all dishonest echoes and propaganda of discrimination and put in focus the real ‘breaking news’. 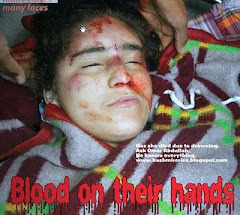 The Kashmir representation crisis, be it Judiciary, Administration, Police. We conclude this series on a note that lies at the very heart of our struggle. Suffering. And a corresponding note that lies at the very heart of their opportunism. Prosperity. 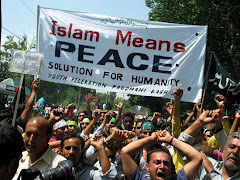 The agents of atrocity were unleashed on us, peace packages on them. Our widows would spend half of their abused lives filling ex gratia relief forms, their ‘madams’ would spend theirs in sending out kitty invitations and gracing tambola assemblies. Our orphans yearned and wept for murdered fathers, their babas whined for play station upgrades. Our enterprise got knocked out, theirs pahalwaned. Our economy crashed, theirs flourished. With all this tragedy of ours and prosperity of theirs, they get the ‘reconstruction’ packages. Ironic. Absurd. We have had to do with lollypops from the centre, and leftovers from Jammu. Always. Our sacrifices, nullified, taunted. Their opportunism, hoorayed. The economic packages for the victim very conveniently diverted to the loud mouth, without even a remote feeling of remorse. 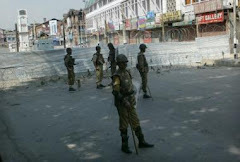 While Jammu basks in an upcoming metropolitan glory, Kashmir remains cornered as ever, waiting, longing for attention. This is no rhetoric. We don’t do it. They will despise this, but sorry, we have the numbers. The State Rehabilitation Council provides data on the trail of disasters we have had over the past two decades. These distasteful comparisons are of course macabre and gory but never the less essential for this debate which has been forced on Kashmir. The number of widows, militant and civilian, ‘due to militancy’ stands at 4104 for Jammu and 15353 for Kashmir. 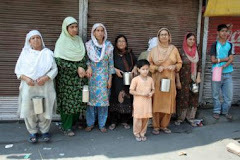 Within Jammu division, Jammu accounts for only six of these widows. The bulk of this number is made up by widows in the ‘anti-national’ districts of Poonch, Rajouri, Doda and Kishtwar. So yes, in death Jammu certainly stands discriminated. 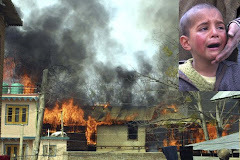 The Council also provides data on the number of orphans ‘due to militancy.’ Kashmir accounts for 20623 orphans while Jammu division has 5732. Again, the pattern is no different. Jammu has two. You don’t have to guess where the other numbers add from. 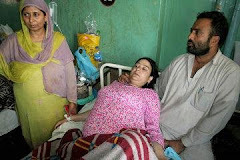 We will not talk about the total causalities suffered in Kashmir. The figures will include militants, pro government gunmen, the innocent old and young, men and women. 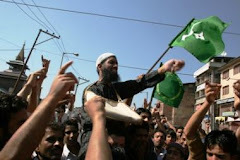 In response to the Kashmir struggle, New Delhi made various promises, be it Plebiscite, ‘Sky is the limit’, Insaniyat. But honored none. Then it was decided to silence the state with economic packages. Everything got reduced to this. All grudges, protests, sacrifices were to be equated with these windfalls. We will only take two such packages which were endowed in response to the devastation. The Prime Minister’s package and the Industrial package, both announced during the previous Government’s first innings. 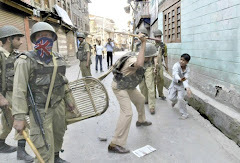 The Prime Minister’s Rehabilitation package was branded as a memorable and celebrated sop to Kashmir. Its fruit, for decades of sacrifice, suffering and sabotage. It was meant for reconstruction of the damaged infrastructure and creation of new avenues of progress and employment in Kashmir which Jammu had already achieved thanks to the massive diversion of funds from Kashmir as a result of militancy. The Prime Minister’s package was worth Rs. 24000 crores, later revised to about Rs. 29000 crores. On this ‘exclusive’ endowment to address our alienation, Kashmir only got Rs. 6447.74 crores, while Jammu got a ‘reconstruction’ boost of Rs. 12530.8 crores, grossly disproportionate to their sacrifice. Knock knock discrimination! We deserved, they desired. And were happily obliged, time and again. We left out in the cold, time and again. From the rest of the package Ladakh got Rs. 2804.38 crores. The remains were diverted to state level sectors and projects such as Transmission & Distribution, Mughal Road, ADB-Counter part funding and so on. That figure stands at Rs. 8929.44 crores. Moving on to the Industrial Package. The package attracted an Investment of about Rs. 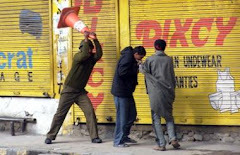 5000 crores to generate employment and amplify the industrial growth in ‘marginalized’ Kashmir. The package also offered impressive incentives to our entrepreneurs in the form of Excise and Sales Tax refunds. But even this package failed to cross Bari Brahmana, and in rare cases managed to reach Udhampur. Kashmir reduced to a spectator, getting less than 10 percent of this Industrial Package while Jammu ran away with the rest, smoothly. The industrial area in Jammu flourished further and units cropped up everywhere with this hijacked mega incentive while as Industry continued to be as elusive to Kashmir as ever. And this won’t probably change for long, considering the strong blockade and respective diversion our funds face at Nagrota. The figures below testify our discrimination in the Industrial Package, which was supposed to be our for the taking. For the previous year (2006-07) the Excise refund stands at Rs. 950 crores. 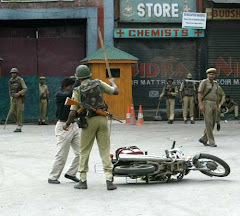 Kashmir component is less than Rs. 90 crores. Sales Tax refund stands at Rs. 400 crores per year, Kashmir component is less that Rs. 40 crores. Very consistent. The Wholesale depots and C&F company depots are shifted to Jammu even though they service the consumer market in Kashmir. Rs. 200 crores are annually collected as sales tax alone in Jammu but paid by dealers from Kashmir, who accordingly have to be at the disposal of the lalajis of Kanakmandi. Unfair. Islamabad, Sept 7: Abdul Rehman, a laborer, is busy repairing the broken windows of mud house while his wife is wrapping her three little kids in a ragged blanket to save them from cold. 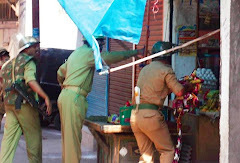 On Saturday the CRPF and police barged into his house and smashed all the window panes of his house and ransacked the household goods. Rehman had repaired the doors and windows of his house barely two months back with the financial assistance of his neighbors. “I barely manage to feed my family and see what these hooligans in Khakis have done to my house,” said Rehman adding that the heavy rainfall from the last couple of days has further aggravated his problem. Like Rehman’s house there are more than 200 houses in Malakh Nag and Cheeni Chowk which have been damaged by the troopers in the past few days. The house of Basheer Ahmad Misgar and Muhammad Amin Tak residents of Malakhnag have also been badly damaged. The troopers fired several rounds at the walls and doors of their houses, the locals said. 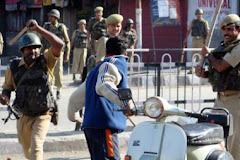 The CRPF and police also smashed the windscreens and side panes of nearly 100 vehicles including the school buses of Radiant Public School. “Though property worth crores might have got damaged but the Deputy Commissioner is turning a deaf ear towards our pleas by saying that we ourselves have damaged our houses and vehicles,” said the residents adding that the Police and the administration refused to lodge FIR against the erring troopers. 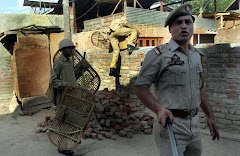 The residents say that their children are living in a state of fear after the incident and are unable to sleep properly as the troopers keep on pelting stones on their houses throughout the night. They also carry gunnysacks with them. 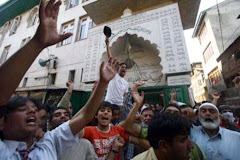 Early Sunday morning, people assembled at Lal Chowk shouting pro-freedom and anti-administration slogans. They lined up all the vehicles damaged by the troopers. 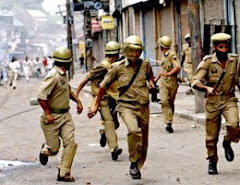 They were demanding stringent action against the erring cops but soon CRPF and police arrived and chased the protesters firing several tear gas shells. 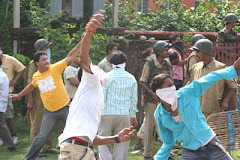 The protesters gave a stiff resistance to the troopers by pelting stones on them and the pitched battles were fought till late evening despite incessant rains. 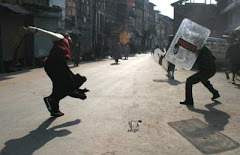 The troopers also fired several rubber bullets to quell the angry youth injuring six of them. 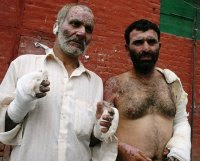 They also barged into several houses in Danger Pora, Qadipora, Mattan Chowk, Cheeni Chowk, Malakh Nag and Mehman Mohalla and beat up the inmates including women to pulp. Srinagar, Sep 12: Insisting people of Kashmir to boycott all the products of Jammu, Shiromani Akali Dal (SAD) leader, Simranjeet Singh Mann on Friday said that economic blockade is an international humanitarian crime and right wing Hindu fanatics of Jammu can repeat it any time again. Mann said, SAD will be preparing a report on Jammu and Kashmir which will be forwarded to rights body, Amnesty International and all the embassies in New Delhi. The Sikh leader also condemned National Security Advisor, M K Narayanan statement about the killing of Hurriyat Leader Sheikh Abdul Aziz in which the former had absolved police of the allegations of the killing. He added that India is not a signatory to the International Convention for Genocide. Mann said that international democratic forces like United States should intervene in the issue of Kashmir as they did in the case of Zimbabwe, Somalia and other conflict ridden areas. 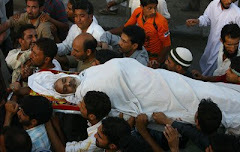 “India allows war mongers like Israeli Army Chief Avi Mizrahi to visit Kashmir,” he added. After Mann was not allowed to meet the detained Hurriyat leader, Shabir Ahmed Shah, he said that New Delhi fears unification process between Hurriyats. “New Delhi claims that there is no single representative in Kashmir, and if Shah unifies the leadership they again have a problem. 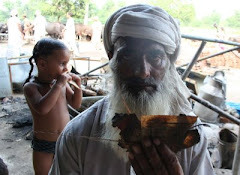 It is shame on the part of democratic state of India,” he said. Reiterating his stand on Kashmir issue, the Sikh leader said that India has no legal political and moral justification for staying in Jammu and Kashmir even for a minute. Accusing New Delhi of double standards, Mann said that while as Muslim, Sikh, Christian and Leftist organizations are often threatened to be banned, organisations like BJP, RSS, VHP, Bajrang Dal and others are spared despite their anti-people activities. He added that seven Muslims were killed after wards to cover the crime, and there is no development in the case even after eight years. He suggested editors of New Delhi based newspapers to be professional and unbiased while covering and commenting on Kashmir. General Secretaries of SAD, local Sikh leaders including Indumeet Singh were also present in the press conference. Mann is scheduled to visit Chattisingpora, Batwota, Kud, Doda, and Poonch. Srinagar, Oct 15: While the successive Governments in Jammu and Kashmir have been trumpeting the state’s affluent water resources with a potential of generating around 20,000 MWs of energy, the real beneficiary of this energy goldmine is not the state but the Government of India, through its subsidiary - the National Hydro Electric Power Corporation (NHPC). Out of its existing 13 power stations, NHPC unilaterally owns three major stations in Jammu & Kashmir – the highest number of power stations owned by the Corporation in any one state besides Himachal Pradesh. These include Salal Power Project with 690 MWs generation capacity, Uri-I with 480 MWs capacity and Dulhasti with 390 MWs. Out of the 5175 MWs of its existing generation capacity, NHPC is drawing the highest booty of 1560 MWs of energy from Jammu & Kashmir alone, while rest of India is contributing just 3615 MWs to the Corporation’s power kitty. This includes 1520 MW from two power stations in Madhya Pradesh, 1020 MWs from three power stations in Himachal Pradesh, 570 MWs from two power stations in Sikkim, 400 MWs from two power stations in Uttarakhand and 105 MWs from one power station in Manipur. And what J&K is getting from NHPC in return for the massive exploitation of its left-over water resources – as the use of state water is already embargoed by the discriminatory Indus Water Treaty (IWT) – a meager 12 per cent (187 MWs) energy as royalty. Out of the 11 upcoming NHPC power stations, the highest number of seven stations would be again in Jammu & Kashmir. These include Uri-II (280 MWs), Kishenganga (330 MWs), Bursar (1020 MWs), Pakal Dul (1000 MWs), Sewa-II (120 MWs), Nimo Bazgo (30 MWs) and Chutak (18 MWs). The state Government signed a memorandum of understanding (MoU) with NHPC for the execution of these seven power projects at the sidelines of the commissioning of the Baglihar Power Project on October 10. Initially, the agreement for handing-over Uri-II, Kishenganga, Pukhal Dul, Sewa-II, Nimo Bazgo and Chuktak power projects to NHPC was signed between the then Union Power Minister P R Kumaramangalam and the then Chief Minister Dr Farooq Abdullah on June 10, 2000. As per the agreement, these power projects were to be executed by the NHPC on BOOT (Build, Own, Operate and Transfer) basis. The state Government, according to sources, is now also planning to ‘gift’ 600 MW Kiru and 520 MW Kawar projects to NHPC. While the total generation capacity of the NHPC’s new power stations throughout the country is estimated to be 4622 MWs, J&K would be again a major contributor to the Corporation’s energy `loot’, contributing the highest chunk of 2798 MWs. And, at the pitiable rate of 12 per cent royalty, the state would get a share of just 335 MWs of this energy. With the commissioning of its seven proposed power stations in J&K, NHPC’s generation capacity would jump to an enviable 4358 MWs from 10 hydro projects in the power-starved state. Curiously, while in states like Madhya Pradesh, Himachal Pradesh, Uttarakhand and North East, most of the NHPC power projects are in joint venture with the respective state governments, sharing energy on 50:50 basis, J&K is the only exception where the Corporation has to keep aside only 12 per cent of electricity as royalty for the state. Ironically, while most of the hilly states like Himachal Pradesh, Uttarakhand and North Eastern region have almost become power surplus, J&K was till recently generating a paltry 300 MWs of electricity from the 19 state-owned power projects. With the recent commissioning of 450 MW Baglihar Power Project, the state’s own generation capacity may now go up to 750 MWs. Even with the augmentation of energy from Baglihar, the gap in the state’s demand and supply position for power is still marginally high, as against the availability of 750 MWs, J&K’s peak-time power demand is around 2000 MWs. The state Government, according to the Power Development Department (PDD) authorities, is presently importing one crore units of power per day from the Northern Grid at a neck-breaking rate of Rs 10 per unit. During the recent month of Ramadhan, the power imports of the state had shot up to 1.28 crore units per day. Another proposed state-owned ambitious power project, the 1200 MW Sawalakote Hydro Electric Project has become a victim of political rivalry. Initially launched by the National Conference Government in 2000 and re-negotiated by the PDP-led Coalition Government, the project was dumped by the Congress-led state Government. The execution of the project is now pending disposal in the State High Court. A stark comparison with the neighboring hilly state of Himachal Pradesh has some shocking revelations for our policy-makers and politicians. Himachal Pradesh is presently generating around 4000 MWs of energy in the state sector and has almost become a power-surplus state. Himachal is planning to have an installed capacity of 6100 MWs by 2010. Paradoxically, against the generation of 1560 MWs of hydro power in J&K, Himachal Pradesh has limited the NHPC’s power generation capacity to only 1020 MWs in the state. With the Government of India having secured the exclusive rights over the use of the waters from the three eastern rivers - Sutlej, Beas and Ravi (flowing through Punjab) and surrendering the rights of the waters from the three western rivers – Indus, Jehlum and Chenab (flowing through J&K) to Pakistan under the Indus Water Treaty, Jammu & Kashmir was already put to a harsh disadvantageous position and whatever limited water resources were left for the state to exploit for its economic development are being ‘looted’ by the NHPC through the back-door. Although various committees, from time to time, the latest being the committee headed by the former RBI Governor C Rangarajan have recommended transfer of NHPC-owned Salal Power Project to the state to tide over its power crisis, the Central Government seems to be in no mood to oblige the recommendation.